From the group that brought you ‘Sounds For Spies and Private Eyes’ comes this joyous frolic through the jazz and funk-laden world of TV themes and incidental music from the 60’s to the 80’s. Who can forget the feeling of excitement inspired by the opening titles of shows such as The Persuaders, Randall And Hopkirk Deceased, UFO or The Professionals? Who smiles when they hear the first notes of Are You Being Served or Some Mothers Do ‘Ave ‘Em? Alongside these, and many others, are some not-so-fiction classics as Grandstand, Parkinson and Tomorrows World plus comedy gems such as The Two Ronnies and The Odd Couple. Children’s favourites Vision On and Batman sit seamlessly with Hawaii 5-0 and The Saint; all interspersed with choice cuts from TV adverts such as the beautiful Black Magic chocolate theme. 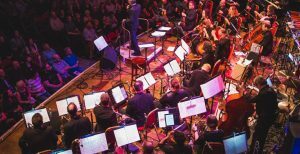 What ties the whole set together is the jazz and funk-inspired writing of such talents as John Barry, Henry Mancini, Keith Mansfield, Ronnie Hazlehurst, Neal Hefti and Johnny Dankworth making Cult Fiction Live, under the baton of William Goodchild, a night not to be missed!